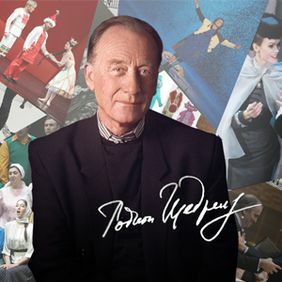 The compositions of Rodion Shchedrin, a big friend of the Mariinsky Theatre, are traditionally performed during the festival Stars of the White Nights in St. Petersburg. This year the audience can enjoy three operas, three ballets and a concert consisting entirely of the works of Rodion Shchedrin which will be the culmination of the festival. On the 19th of June 2018 in the Concert Hall of the Mariinsky Theatre will be held the world premiere of the work “Balaechka-Minorochka”, which was written in 2015 with the Soloist Ekaterina Sergeeva. During the concert another work for voice and string orchestra under the title “Tanya-Katya” with Pelageya Kurennaya will show the possibilities of this glamorous singer. The Double concerto for Violoncello and Orchestra with Sergei Redkin and Alexander Ramm will be the last work of Rodion Shchedrin on this evening. Valery Gergiev is the conductor of the evening and will lead the Symphonic Orchestra of the theatre through the works of Maestro Shchedrin. The operas of Rodion Shchedrin will be presented at the stage of the Mariinsky 2 Theatre and in the Concert Hall. On the 2nd of June the audience can hear the opera “The Left-Hander” made by director Alexei Stepanyuk under the conduction of Valery Gergiev. On the 9th of June at the Stage of the Concert Hall of the Mariinsky Theatre the opera “Not Love Alone” which became the main event in the last season will be presented to the audience in the version of the director Alexander Kuzin. On the 10th of June the Russian Choir Opera “Boyarinya Morozova” will be presented to the audience under the conduction of Andrey Petrenko. The ballet program of the festival will have the world famous “Carmen Suite” in the choreography of Alberto Alonso on the 28th of June and 5th of July as well as 2 ballets in the choreography of Alexei Ratmansky: “Anna Karenina” after the novel by Leo Tolstoi on the 8th and 9th of June as well as on the 27th and 28th of July and the ballet “The Humpbacked Horse” after a ferry tale of Petr Ershov on the 25th and 29th of July. The performance on the 29th of July will close the festival the Stars of the White Nights in St. Petersburg.